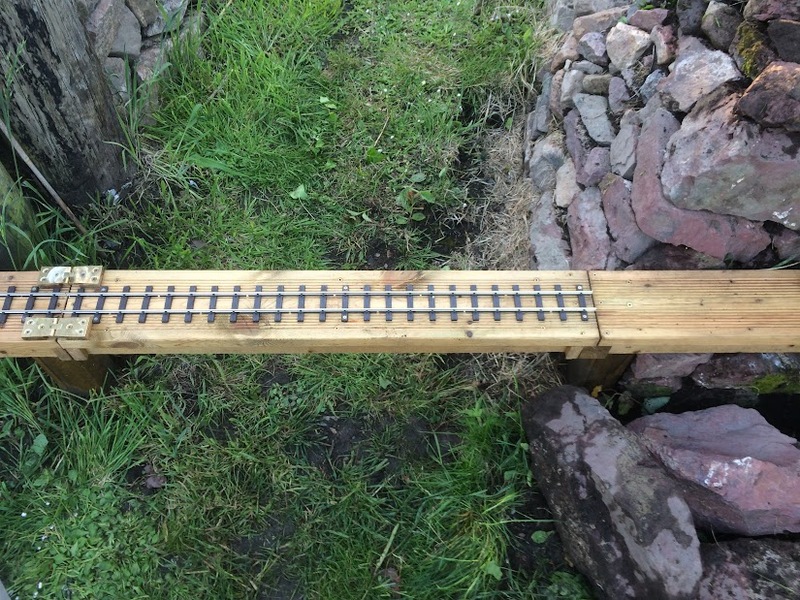 I’m a bit behind with reporting progress on Phase 2 but here’s the first bridge: a simple lifting bridge that, at around 9″ above ground, can easily be stepped over during running sessions but can be lifted completely out of the way to use the garden at other times. Into the holes I set 75mm posts with postcrete (the dry mix you drop in the hole and just water). The bridge and the trackbed either side is decking planks on pressure treated 2×1. I cut and joined the decking at an angle for the curve on the approach to the bridge. I screwed the trackbed to the post. I used counter-flap hinges to connect the bridge to the support. These allow it to fold right back on itself. At the other side, I used a a piece of 2×2 to give the bridge something to rest on. I’ve set a screw and some washers into this, and drilled a hole into the underside of the bridge, which sits over it to ensure the track stays aligned when the bridge is down. I gave the wood a coat of creocote (which is presumably some slightly less carcinogenic alternative to creosote). I screwed the track to the deck with 16mm screws. And I hooked it up to the loop! I completed the bridge in late May. I’ve had to make some minor adjustments to the alignment of the track as its settled, and being a spur to nowhere at present it’s had little traffic (I tend to run across it once after steaming up on the other side, then just run round the loop). But it’s been lifted and dropped many times, including taking some punishment from younger relatives. It hasn’t fallen apart yet! Photos taken: 23 April, 15, 21 & 22 May.